An autonomous power generation centre has been created at North-Komsomolskoye field to ensure failure-free power supply to drilling units and processing facilities. The centre comprises mobile smart gas-turbine units with a capacity of 2,500 kW each. Their main advantage is associated with low-cost power generation at drilling horizontal wells of up to 3.5 km – 1 kWph is five times cheaper than diesel-driven generators provide. In addition, as the amount of power fed to a drilling unit changes upon the drilling technique and rock composition, gas-turbine units can survive a sharp shift in load volume. Decreasing costs of well construction is one of the priorities set in the Rosneft-2022 Strategy. The Company is constant in its exploration of new effective solutions and supports the introduction of domestic innovation. To further reduce the costs at the field, pilot tests of the gas-reciprocating power plant have begun; gas reciprocating units are also able to withstand sudden shifts in load, but are more efficient than gas-turbine units. Should the pilot tests prove positive, a decrease in fuel costs will help achieve the economic advantage. 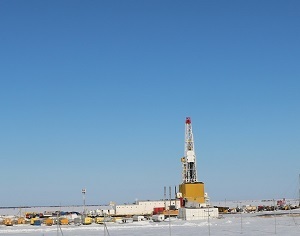 The development of North-Komsomolskoye field will contribute to inclusion of new high-viscosity oil reserves and to fulfilment of the exploration potential of the licence area, as well as to replacement of the resource base and to maintenance of the oil production level in Yamalo-Nenets Autonomous District. North-Komsomolskoye field is located onshore within the Pur and Nadym Municipalities of Yamalo-Nenets Autonomous District. SevKomNeftegaz LLC, a joint venture of Rosneft Oil Company (66.67%) and Norwegian Equinor (33.33%), is developing the field. As of January 1, 2019, the remaining recoverable oil and condensate reserves (AB1B2) amount to 206 million tonnes, gas reserves 168 billion m3. The North-Komsomolskoye oil features high viscosity, so sophisticated technology is applied to the production process to make it efficient.